Guruji Shri Narendra Babu Sharma speaks on Tirupati Chandra Kshetram. Guruji gave us the information on procedure to climb the holy hill, on which day we should climb, which day we should have darshan and what we should carry with us. 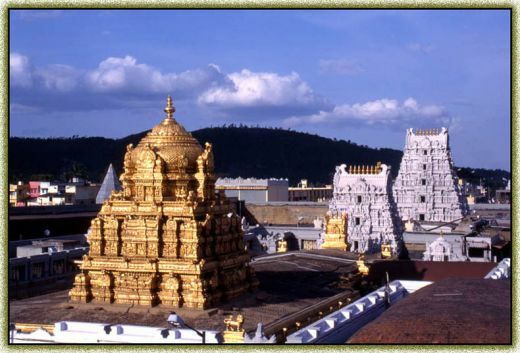 This post will answer above all questions and will give you lot more information on Tirupati. Purchase One Havala Karimani of good quality for One family, Havala Karimani are available at Jewellery shops. You should start climbing the hill on monday early morning before 06:30 AM. Start climbing the hill after having bath. Don't wear any kind of footwears while climbing the hill. Before starting to climb, have the darshan of Pada Rakshe. Place the pada rakshe over your head and pray to god. 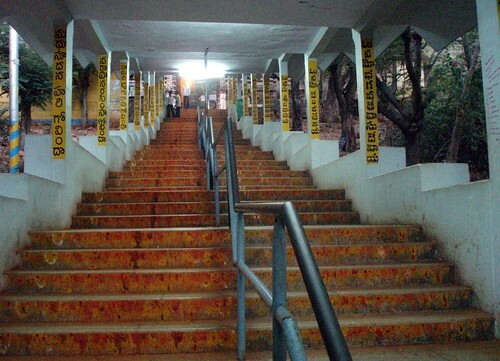 People who dont climb the hill, willing to travel by vehicle should also have the darshan of pada rakshe. 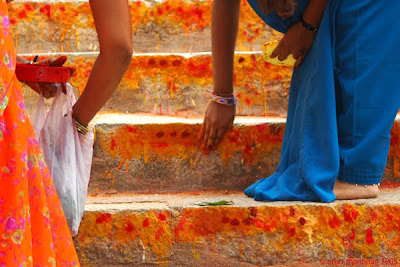 Apply turmeric (Arishina) paste and bright vermilion/sindhur (Kumkuma) to every step you climb. If two women climb the hill both should apply arishina & kumkuma to steps. If one men and women climb the hill one can apply kumkum and other can apply arishina. If possible you can also keep flowers to all steps, while climbing along with arishina & kumkuma. Atleast two members from a family should climb the hill, others who can't climb can travel by vehicle to hill top. Havala Karimani should be carried by the person who climb the hill. Before starting to climb the hill, have some milk or fruits. After starting to climb, don't have snacks, foods prepared from rice. On the way to hill top, you will get Lakshmi Narashimha Temple, Offer the Havala Karimani to Lord Lakshmi Narasimha and take it back and continue the journey. You Should Visit Sri Kapileshwara Swami Temple : Famously called as Kapila Theertham, Situated at the foot of Seshadri, this Theertham is sanctified by a Lingam known as Kapileshwara. According to Varaha Puranam, this Lingam was originally worshipped by Kapila Maharishi in Paataalaloka (Netherworld). Once it surfaced on the Earth through a deep concavity. The Devas started worshipping the Lingam and consecrated it at this spot. It was through the same concavity that Kamadhenu, the boon-giving celestial cow, also emerged on the Earth. The small pond or Sarovar in front of the Lingam is the Theertham. A holy dip here is believed to confer maximum benefit and rid the devout of sins. Bhavishyottara Puranam says that Vakuladevi , before going to Aakaasharaja to discuss Srinivasa’s marriage to Padmavathi, had a sacred bath in Kapila Theertham, as ordained by the Lord. After Reaching the hill top, go to your rooms and you can take rest. You should have darshan of Lord Venkateshwara only on Tuesdays. 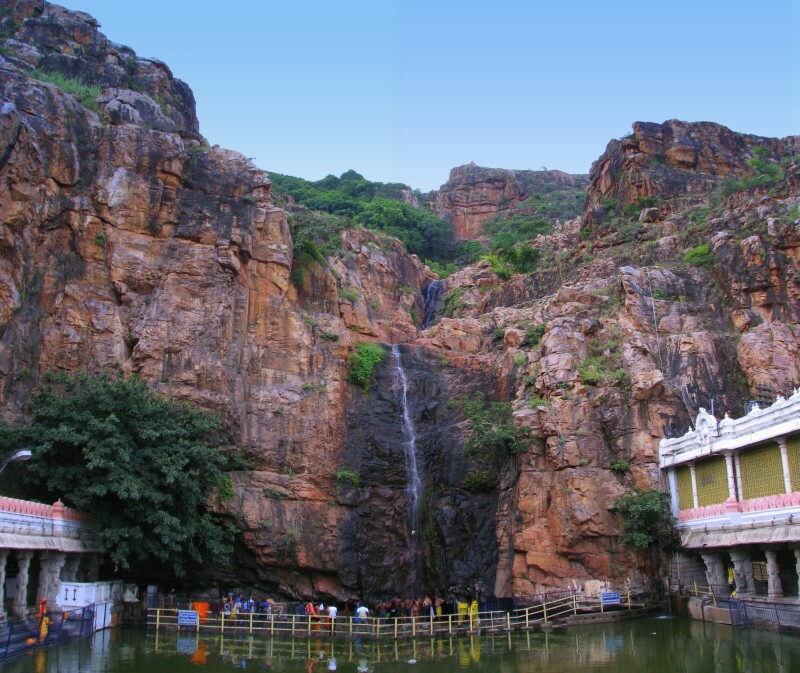 Before going for drashan, you should visit The temple of Sri Varahaswami in Tirumala is to the north of the Sri Venkateshwara temple, on the banks of Swami Pushkarini. The presiding deity is Varaha Swami, an incarnation of Lord Vishnu in the form of a boar that was staying on the hills when The Lord descended unto earth. He had to take permission from Lord Varaha to stay here and grant HIM (Lord Varaha), the privilege of first view by the visiting pilgrims and first Naivedyam (sacred offering of food to Lord for consecration) in return. Thus it is imperative that pilgrims visit Sri Varaha Swami first and The Lord, only later. According to legend, Tirumala was originally the Adi Varahakshetra (place belonging to Sri Adi Varahaswami). Lord Sri Venkateshwara took up residence here, with the permission of Sri Varahaswami. According to Brahmapurana, Naivedyam (food offered to God) should first be offered to Sri Varahaswami. Pilgrims should visit Sri Varahaswami temple prior to Sri Venkateshwara temple. After Visiting Varahaswami temple purchase these items i.e yantras (engraved on silver foil) to be offered in the hundi in which the required image like house, hand, leg etc are embossed which is sold in tirumala, if possible you can carry it from your place itself. Male Doll - For all male family members. Female Doll - For all female family members. 5 balls - For one Family. 1 Vasthu Purusha - Head of the family. 1 Navagraha Yantra - Head of the family. 1 Dhanvantri - Head of the family. 1 House - Head of the family. Carry these items for darshan, after having darshan drop them in hundi. Womens should not tonsure their head completely. Womens should give only panchamudi (They will cut the hair from five portions of the head) to lord. Men from any age can tonsure their head. Female kids can tonsure their head till they attain puberty.